The Good Guys: A Telemystery Series. 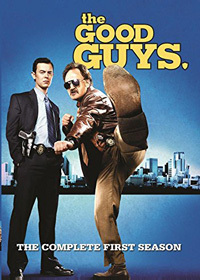 Bradley Whitford stars as washed-up Dallas detective Dan Stark, who is partnered with Jack Bailey (Colin Hanks), an ambitious, by-the-book cop, in this Fox crime "dramedy" that aired for one season during the summer/fall of 2010. Original US air dates: 05/19/2010 (pilot), 06/07/2010 to 08/02/2010, 09/24/2010 to 12/10/2010.